Lis-Simmons is using Smore newsletters to spread the word online. Looking for a way to share new items as well as news items from the Lenape Library, I've found a great tool in smore. Found out about it in the wide wide world of on-line networked teacher librarians/media specialists. I hope to send the link when there is enough to share - but not too much - that highlights features in the Library that can serve teachers and students. Beautiful artwork and great stories. You may know them as Picture books but they are much more than pictures. The stories can be read in one sitting in anywhere from 10 - 25 minutes - longer if discussion will be a part of the sharing. Many of these titles can be found on our Compassion and Empathy shelves. They're kept in alphabetical order by author's last name, just as Fiction titles are kept. Bear with us as the on-line catalog is being updated. I was not sure how I felt about a subscription book service when I gave JLG a try about 4 years ago. I love the selections and I think you and your students will, as well. Featured on the shelves by the world map, as well as other locations, it will not take you long to browse through the Biography/Memoirs to see the range of non-fiction/informational connections that can be made with the starting point of a person's name and place of origin. 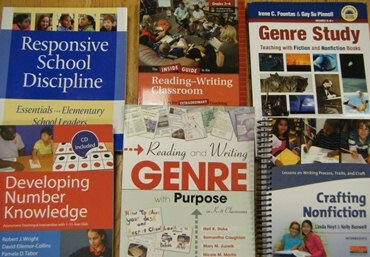 The Fiction titles on a variety of reading levels are a breath of fresh air. 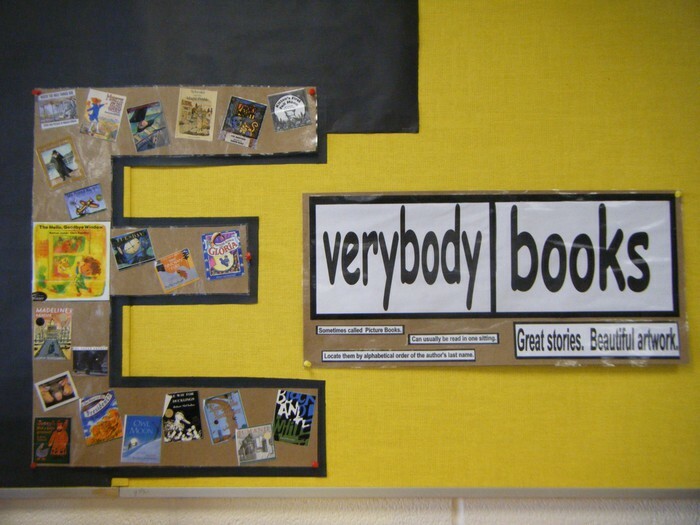 Check one out and see how a new read aloud can spark attention. Coming soon, emerging reader non-fiction. New titles are consistently added to this growing collection. Books from workshops that you attended, or did not attend but wanted to, are here for your perusal or study. In the physical space where they live, the arrangement is shifting and hopefully this will add a new perspective to titles you haven't seen. This collection needs weeding and all imput is welcome. Scanning is a skill. This is true when navigating a computer screen, a print book, a handheld device, a menu, a train schedule. Each format requires the reader to have a sense of what she is looking for and the ability to think about what the "page" offers before a starting place is chosen. "Where do I click?" isn't always the best, first question. Using any resource mentioned above, a better question before proceeding might be "What do I have here?" 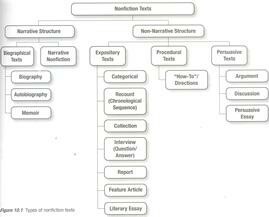 One of the new books in the Professional Collection called Genre Study by Fountas and Pinnell includes a chart of the many types of texts that fall under the umbrella of Nonfiction. Students may find it interesting to learn just how much variety is in this category. Hard copy of the chart is available in the Library for better viewing.